We here at OTB are dedicated to providing the best quality food right to your doorstep. It's no surprise that Marizel would end up in the culinary world. 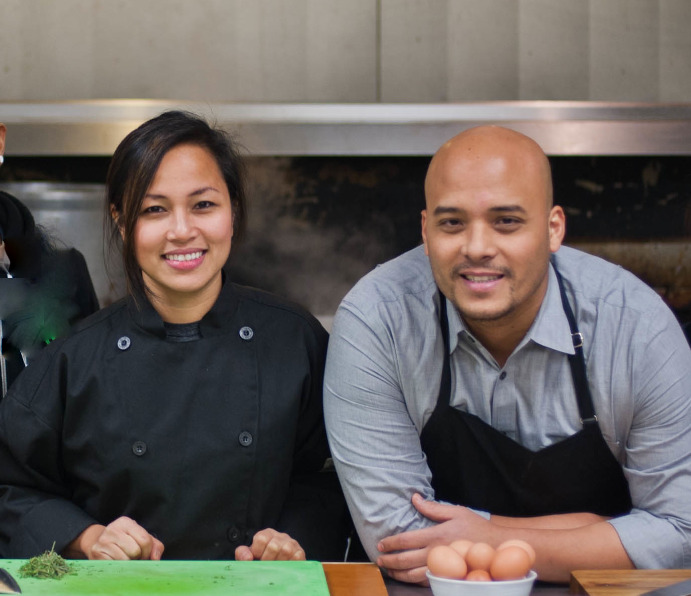 Born and raised in the Philippines, she comes from a family of avid cooks and green thumb. Her grandparents owned acres of land boasting of Mango trees, tropical fruit and vegetables, and free-range chickens. Her own backyard consisted of fruit bearing trees such as Guava and tamarind. She grew to appreciate and respect the hard work it involved in cultivating and harvesting produce. In 1999, she landed her first opportunity as a pantry cook at the late Axis under Executive Chef Alvin Binuya. Although her employment was brief, Chef Binuya took notice of her strong work ethic and told her, "you would go far in this industry". Her passion for food and cooking became more evident, leading her to Seattle Culinary Academy. To assist with tuition, she juggled several jobs. From pantry cook at Chinoise in Madison to Catering server at Ravishing Radish, then cashiering at a local grocery store. Two years later, she applied for a prep cook position at the prestigious Washington Athletic Club where she managed to work her way up to a Sous chef. But her greatest achievement had yet to come. Her first child, Madisen, was born in 2005. Followed by Masen, two years later who at an early age, was stricken with various food allergies and illnesses, prompting her to change their eating habits. There began her experimentation with gluten-free cooking. Shortly after, her husband Clarence convinced her to join a Crossfit gym owned by some close friends. They agreed to participate in a 30-day Paleo challenge at the gym and succeeded; feeling energized and lighter. Now a mother of three, she and her team dedicate their time in sourcing local, high quality, farm-to-table ingredients and providing creative, healthy meal options for you. Contact Marizel@eat-otb.com for personal chef services. Charles learned kitchen skills and ethics at an early age learning from his father who was the Executive Chef at the Harbor Club in Seattle for many years. He developed culinary skills through the many catering events he has been exposed to throughout the years. Any advanced culinary techniques can be accredited to studying his dads collection of Bon Appetit magazines, many cookbooks and Food Network. Charles started catering for family and friends and later opened up to a wider client base in 2010. He was later introduced to Marizel through common friends of the King Crossfit community and decided to team up and start Outside the Box. He has been in management in the hospitality industry with Island Hospitality since 2007. Most recently managed the opening of the new Rivue Bar & Grill in Bellevue downtown. Proud moments come from teaching some important life skills such as cooking, grocery shopping, and washing dishes to his two young sons Ashton & Ethan.